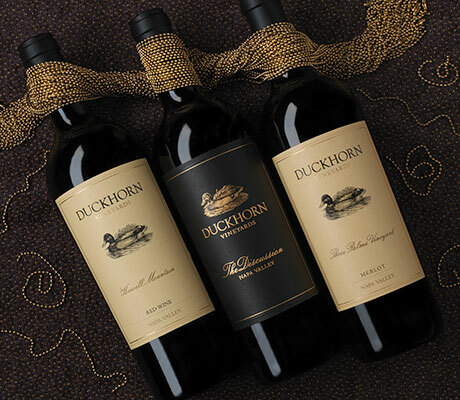 Every year, the Winemakers of Duckhorn have a friendly competition to see who can make the best wine in a given category. As stated in an earlier post, this year’s wine category is “Orange Wine”. To see a great explanation of what Orange wine is, see Neil’s August 17th post. The Paraduxx wine this year is made of Viognier that was fermented on skins for 5 days, similar to the way a typical red wine is made. After 5 days and a completed primary fermentation, we pressed and racked to barrel. The one big variable that will make the Paraduxx wine stand out is that we are aging the wine in barrel under sea water. On a recent sales trip to Southern California, I stumbled across a Gruner Veltliner from Austria. Only 2 barrels of this wine is made every year. These barrels are aged for 6 months under water in the Black Sea! This was one of the most amazing wines I have ever tasted. It was amazingly fresh and had just a hint of salinity that you would never notice if you weren’t looking for it. Rarely do I taste a wine that stops me in my tracks. It was truly inspiring. 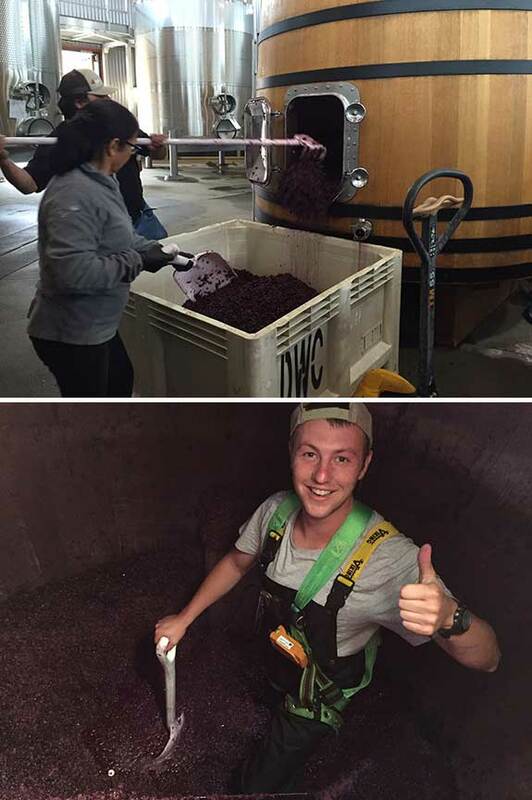 So this year, we are trying this technique in the winery rather than in the ocean. It’s a do or die move for sure! Go big or go home, right? Let’s hope it pays off. In her free time, Crystal is an aspiring photographer while chasing around her two children and youthful spirited husband, Steve. 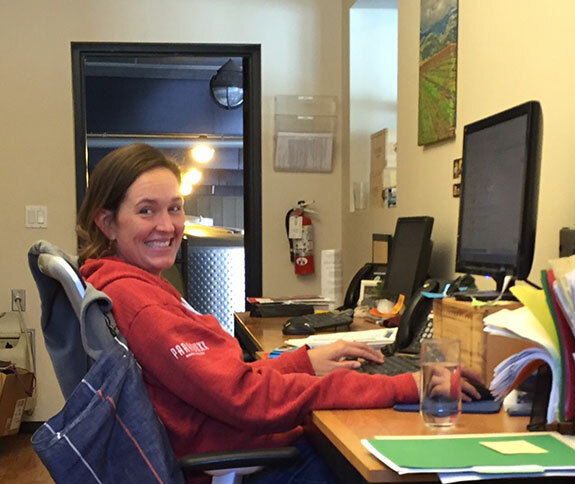 Thank you Crystal for making Tuesday and Thursday the best days at the winery! During harvest, there are a multitude of people outside the company that are key to the success of Paraduxx. Our gas supplier is just one partner that is crucial to our prosperity over these few months. Argon, Nitrogen and Dry ice (Carbon Dioxide) are just a few things that we heavily rely on during this stage of the winemaking process. All three of these gasses are used to protect the fragile juice and fermenting wine from oxygen. Running out of any of these gases would be detrimental to wine quality. Complete Welders is the epitome of reliable. They are always available, always have what we need and are always here when we need them. And, as you can see from the video, there is always a little flair to their efficiency! Thanks Carlos! 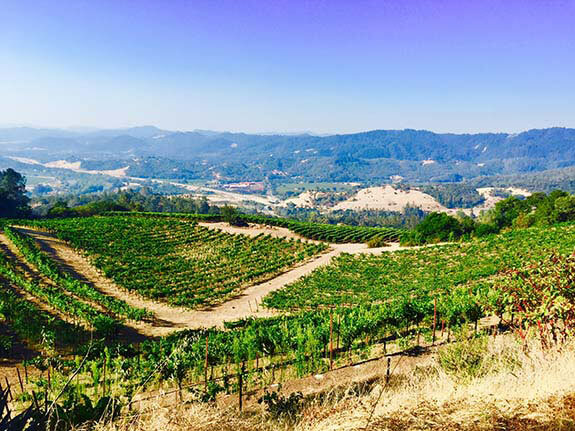 Placed on a steep hillside on the western facing slope of Oak Mountain in the far north of Alexander Valley, Ridgeline Vineyard is a stunning place. This magical place was first developed by Emily and Hartwell Preston in 1869 as a vineyard and orchard. It soon became home to Emily's spiritual commune in 1875, a place where she could use her self-proclaimed gift of spiritual healing. Mrs. Preston soon collected a large community of followers which helped add to the diversity of the ranch. A hospital, church, and "Knob Hill" cemetery were added making the area known as the town of Preston. The Northern Pacific Railroad even added a train stop at Preston in 1889. After the death of the Prestons, the land was divided up and controlled by a few different families. The Green's ran a Bohemian artist colony, The Fischbach's had a colony of performing artists and the Oster's owned a boys school and camp...just to name a few. It's said that the music of The Golden Toad musical ensemble filled the air for decades. 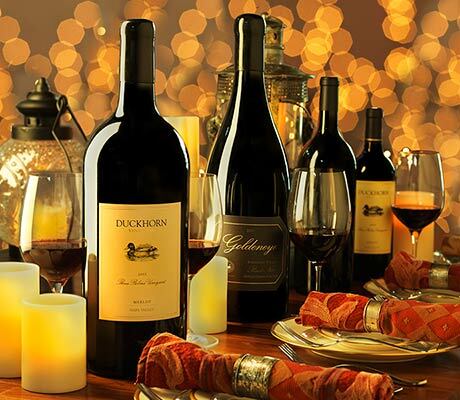 Duckhorn Wine Co. bought the Ridgeline Vineyard in 2012, our first Estate Vineyard in Sonoma County. At the time, I was personally working with 100% of the grapes from the ranch for our Decoy brand. It was soon discovered that the quality of the ranch was in the top 1% of Alexander Valley wine grapes. While being incredibly important to the core of Decoy, the quality of Ridgeline deserved a wine to truly show its value and interesting character. In 2013, Paraduxx began producing a Ridgeline vineyard designated blend of Tempranillo and Cabernet Sauvignon. This small production of 250 cases is modeled off of the famed blends of Vega Sicilia from the Ribera del Duero region of Spain. Our Blend has a rich and Juicy Palate with loads of Blackberries and Christmas spices. The impressive length and tannin structure really show off what is possible in Alexander Valley. Every harvest, we make our "Harvest 101" educational program available to any non-production employee that would like to live a day in the life of Paraduxx harvest. Our first victim this year was Lindsay Romm. Lindsay just started in our customer service department this year. 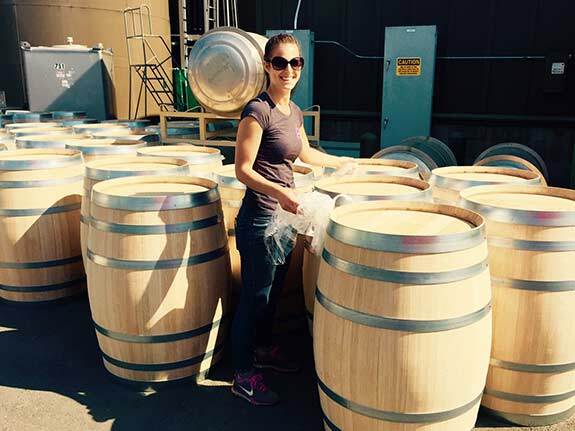 Originally from New York, Lindsay moved out to California to pursue her dream of working in the wine industry. An avid CrossFit'r and former high-school basketball and soccer player, Lindsay was a natural in the cellar. After a little time getting her bearings on the sorting table, we quickly realized that she needed more physical stimulus! Luckily a truck with 40+ new barrels showed up. Nothing says "workout" like unloading a barrel truck. I think Lindsay now has a lot of respect for the people that have to move a lot of barrels around, it's not as easy as it looks. She definitely got the hang of it and has a cellar job waiting for her when she gets bored answering the phone! Thanks Lindsay! A wise man once said that the sign of a good vineyard is the view. Our Stout Vineyard is a GOOOOD vineyard. This perfect plot of land sits high above the fog line on Howell Mountain. 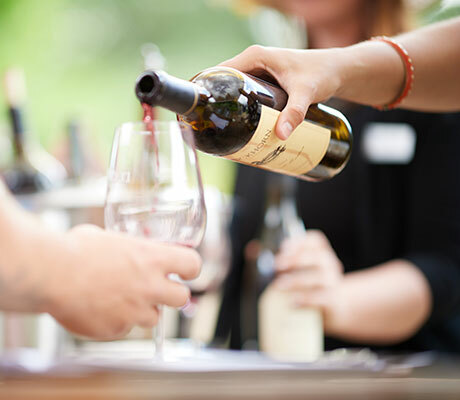 To taste the wines of Howell Mountain is a special experience and wines from Stout are no exception. For Paraduxx, we get a range of varieties. The Cabernet Sauvignon and Syrah go together to make our Howell Mountain blend, a wine modeled from the Cabernet/Shiraz Blends of South Australia. In addition, we harvest Grenache for our Rhone style Syrah/Grenache blend and a little Zinfandel for our Proprietary Red Wine. 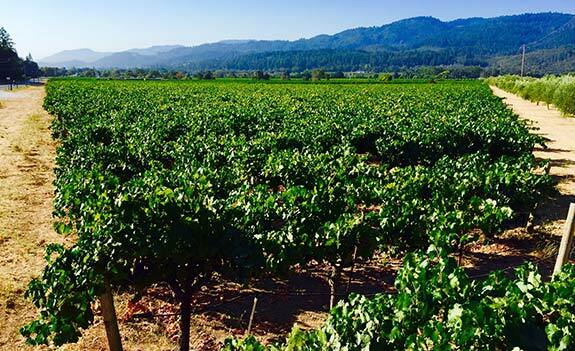 The wines produced from Stout have an amazing distinction that is easily identified as Howell Mountain. Dark color, deep and rich flavors of stewed blackberries and cherries. A touch of leather and tobacco on the nose. 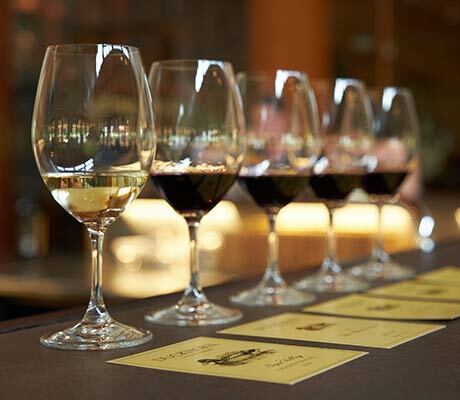 These wines are riddled with complexities and will keep you thinking and sipping! Monitor Ledge is an important part of our Paraduxx wines. We don't make a vineyard designated wine from this ranch but the Cabernet Sauvignon and Zinfandel we harvest here is important to Proprietary Red Wine blend. 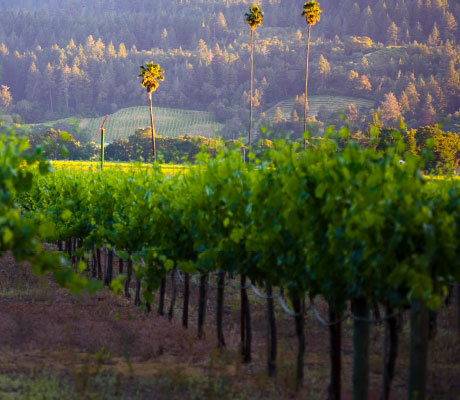 Monitor Ledge Vineyard lies just south of our Three Palms Vineyard in Calistoga. Sitting on the Silverado Trail, the vineyard has well drained rocky soil and is on the flat bench of the Vaca Mountains. Well exposed to the afternoon sun, the grapes grown here are always the picture of ripeness. Beautiful varietal characters on the nose and palate of these wines, they are truly wines grown in the perfect area for their given varieties. Quintessential Napa Valley! Our daily Vineyard Maturity Analysis is one of the most important parts of harvest. You only have one shot at picking grapes, it's important to get it perfect every time. Every morning, our sleep eyed vineyard team will head out very early to pull grape samples from the vineyards. We'll sample each vineyard block about once a week. They deliver the samples of around 20 clusters to the designated winery for that block. Once in the winery, the cellar team takes over. The grapes will be crushed and drained into juice samples. The juice is then brought into the lab for analysis. 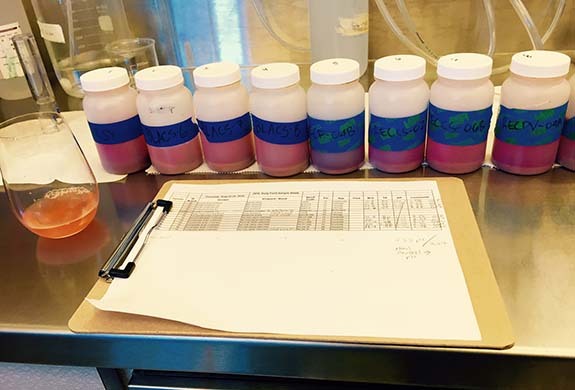 For each sample, we will run Brix, pH ,TA as well as tasting for sensory analysis. Brix is the measure of sugar in the juice, pH and TA are measures of acidity. pH measures the acid level that shows you how stable the juice will be against any kind of microbial infection or oxidation. The lower the pH, the more stable/safe the juice or wine will be. pH range for white varieties ranges from around 3.1 to 3.6, reds range from around 3.5 to 3.9. TA measures the acid you can taste. TA will range from the tooth enamel stripping 0.8 to the flabby/soapy 0.4 for reds and whites. The tasting of the juice is the most important part. You may have perfect numbers for Cabernet at 25 Brix, 3.6 pH and 0.58 TA but if the flavor is missing or tastes under ripe you will have a wait. Patience is a virtue in winemaking! 2016 is proving to be a fantastic year for flavor so far. We are getting ripe flavors before the sugar and acids are ready, that's a great sign! If you could read the clipboard in the picture, it would tell you that the Rector Creek Cabernet is at 20.6 Brix, 0.68 pH and 3.1 TA. The flavors are already amazing but the sugar and acids aren't quite there yet. A few weeks to go and looking forward to it! The Other Harvests of Duckhorn Wine Co. Taking full advantage of Northern California’s perfect growing conditions, most of our properties are home to more than just grape vines. There is a behind the scenes horticulture movement happening at Duckhorn Wine Co. From the beautifully maintained veggie gardens at Paraduxx, Duckhorn and Goldeneye to the 150 yr old Olive trees at our Stout vineyard, Duckhorn is committed to the idea of diversity. We have amazing partnerships with local producers to help process some of these items from time to time. Orchard designate olive oils and Ridgeline Vineyard honey are just two of the products we produce for our employees when the growing season allows. Our landscape/facilities team of Alfredo, Vicente and Rafael are simply amazing! Gifts of cut lavender, rosemary and other flowers will simply show up in our cellar for the team to bring home. If you need tomatoes, peppers, squash or figs….look no further. We very lucky to have such bountiful luxuries available to us. If you are ever at one of our tasting rooms, don’t hesitate to wander through the veggie patch to check out the riches, maybe a ripe strawberry will be there for the taking.